We are an established supplier of workshop tools and garage equipment developed specifically for the tyre trade, and we have serviced the industry for over 10 years. We provide a huge range of exceptional quality yet affordable products of which are our own brand manufactured in Europe. Our customers range from small scale independent mobile tyre fitters to large fast fit chains . Whatever the size of your business we will provide the same exceptional service we are renowned for. Contact us via telephone or email for more information or advise about any equipment available, calls and emails are responded to quickly. Value GE have distributors are situated all over the UK. To Whether your loosening the beads, detaching the old tyre or replacing a new one. This can be a really difficult and knuckle-scraping job when it comes to tyre changing, especially with the old manual or “walk around” tyre changers But, a tyre changing machine from our VE range can make the whole process easier and faster. The equipment is built and designed in such a way to offer the utmost safety measures while still offering exceptional value for money. Tyre Changer Machine UK – The Best Way to Remain On the Road! As a company with 3 decades of experience in the automotive industry, we do understand what it takes to create and offer the very best tyre garage equipment. We have been in business for quite some time and therefore understand what is good for our clients. In all our time of serving our clients in, we have been able to deliver high-quality tyre equipment for our clients across the globe. 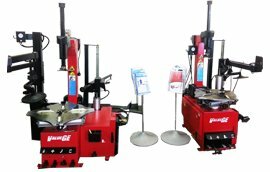 At V-Tech Tyre changer machine UK, we are renowned for diversity when it comes to quality and affordability. Our brand of tyres is not only manufactured in Europe but also one of the best in the world. We understand that different garages have different budgets and for that, we offer a wide variety of tyre packages to suit every pocket. It doesn’t matter whether you are a start-up mobile tire fitter or a well-established fast fit chain, we will offer you the services and equipment you need to keep business booming and ticking over efficiently. For more details, contact us by phone or email. We have some of the friendliest staff that will be most willing to listen and offer the best advice regarding our tyre equipment. Whether you want to loosen the beads, replace or detach your old tyres, call us to inquire about our tyre equipment for sale. You just can’t afford to miss out on your best choice.